Carson got a new bike, courtesy of Grandma Bea and Grandpa Gene, thank you! 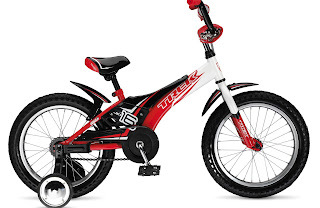 It's a Trek bike, and Carson loves it. We went to Scheel's yesterday to get it, and as soon as we came home, Carson was out riding it all afternoon. We are so glad he has a bike that fits him now. Thanks for the link! I'll add you guys to our list. How fun! That bike looks like a lot of fun. We need to get something for J'anna to ride on, I think. Look Ma': No Training Wheels!